Celebrate your next event at All Fired Up! We have private party rooms and special activities for groups of all ages. We have private party rooms available at our Midlothian or Short Pump locations. In Midlothian, our party room can be reserved for groups of 8 or more. The room fits 15 painters, but larger parties may be accommodated as well. In Short Pump, our party room can be reserved for groups of 8 or more. The room fits 24 painters, but larger parties may be accommodated as well. A party staff person will help get your party rolling and give you tips and pointers along the way, and even clean up after you! Each party package includes a private party room, a personal party assistant, a project for each child, all the supplies and firings and a complimentary gift for the guest of honor. Plus, everyone gets a $5 gift certificate for a future visit! Items created at your party will be fired at the shop and ready for pick-up in one week. Feel free to bring any food or drink for your guests. For each package there is a minimum of 8 guests. Each child has a choice of a collectible animal, 12 oz mug, rimmed or coupe salad plate, bud vase, or pencil cup. This party runs 1.5 hours and includes a choice of a salad plate or a 12 oz mug for the guest of honor. Each child has a choice of a party animal bisque piece, small dinner plate, or 16 oz mug. This party is 1.5 hours and includes a complimentary salad plate or 12 oz mug for the guest of honor. Each child has a choice of a bankable or box. This party is 1.5 hours and includes a complimentary dinner plate or 16 oz mug for the guest of honor. Each child will create a nightlight or sun catcher from glass. This party is 1.5 hours and is limited to children ages 8 or older. This package includes a choice of a salad plate or 12 oz mug for the guest of honor. Each child creates and paints a piece from wet clay. The host can choose for party guests to create a fish, self-portrait, pot or clay plaque/tile from wet clay. This party is 1.5 hours and includes a choice of a salad plate or 12 oz mug for the guest of honor. This class is limited to children 6 and older. 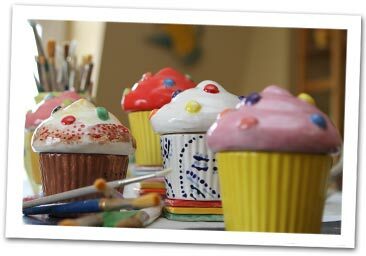 Each child will create and paint a piece from wet clay as well as throw on the potters wheel. The host can choose for party guests to create a fish, self-portrait, pot or clay plaque/tile from wet clay. Each child will also experience the thrill of throwing on the potter’s wheel. We suggest wearing art clothes for this package. The party runs 2 hours and is limited to 12 children. The package includes a choice of a salad plate or 12 oz mug for the guest of honor. Great for a shower, birthday, family reunion, girls’ night out or corporate team-building event! This package includes a private room for 2 hours with a personal party attendant. The cost is the price of the piece. There is no additional cost as long as you have a group of 8 or more.